The author of this article works as a museum teacher at the educational department of the Drents Museum and is an active member of the living history group Byfrost. Part of my job as museum teacher at the Drents Museum in Assen is attending to the all the groups that visit our museum. This includes the great number of children, both elementary school and high school students, that visit our museum. A lot of children think of a museum as a boring place where there is nothing to do but look at old paintings. Many only go to the museum if their parents or teachers make them go. No matter the age group, we try to let them experience history. We try to change this image by offering activities that connect to their perception of the world and their interests. By using different techniques and methods we try to show them how much fun history can be. It’s all a matter of taking the right approach. Experiential archaeology is one of the tools that can be used in this endeavour. 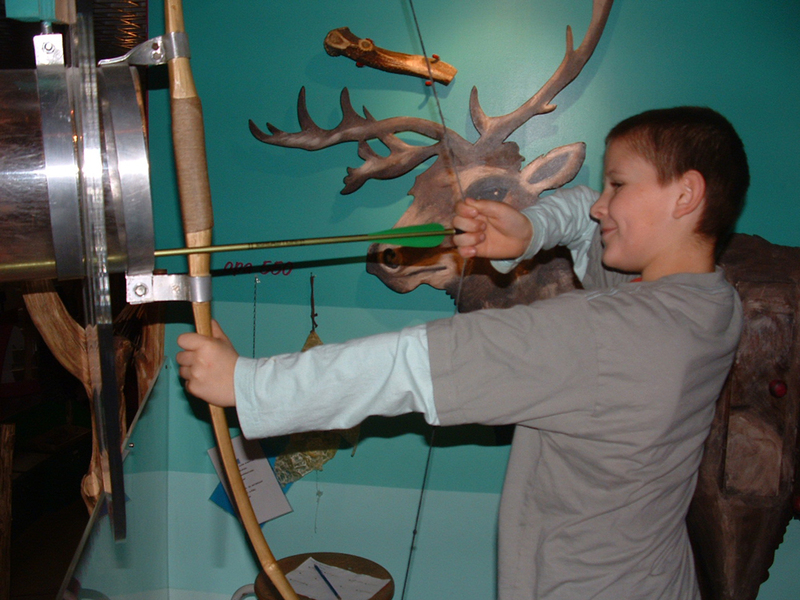 This was a special program set up for the 10 to 12 year olds that included a visit to our discovery room, a space where the kids could learn about history through activities like touching real mammoth bones, shooting a bow and arrow or grinding flour on a real muller. Another part of the program was a guided tour across the archaeological department to see the real objects after having worked with the replicas in the discovery room. The Discovery room had to make place for new educational spaces that are still under construction. We will use these new rooms to continue to give children not just lessons but experiences. Special programmes for school were also created for 12-14 and 15-18 year old children. For example there is the programme Stone Cold, Ice Cool, where the students are given a PowerPoint presentation and are also confronted with real objects and replicas that illustrate the historical story being told. After this they get to try out several techniques themselves, such as cutting through leather with a piece of flint, carving a needle out of bone using a flint fragment or sowing with a bone needle and gut string. This way they get a sense of how much time and effort went in to making objects that they think of as ‘simple’. No matter the age group, we try to let them experience history. Visitors of the exhibition Expedition Archaeology! can work with both kinds of experiments to find out more about different techniques from the Stone, Bronze and Iron Age, as well as the Roman and Medieval Periods. The visitors can try to retrieve many of the techniques and skills that have been lost through the centuries. Once a year in the fall, we organize an archaeology week. In this week we have lots of extra archaeological activities for the children (and their parents). 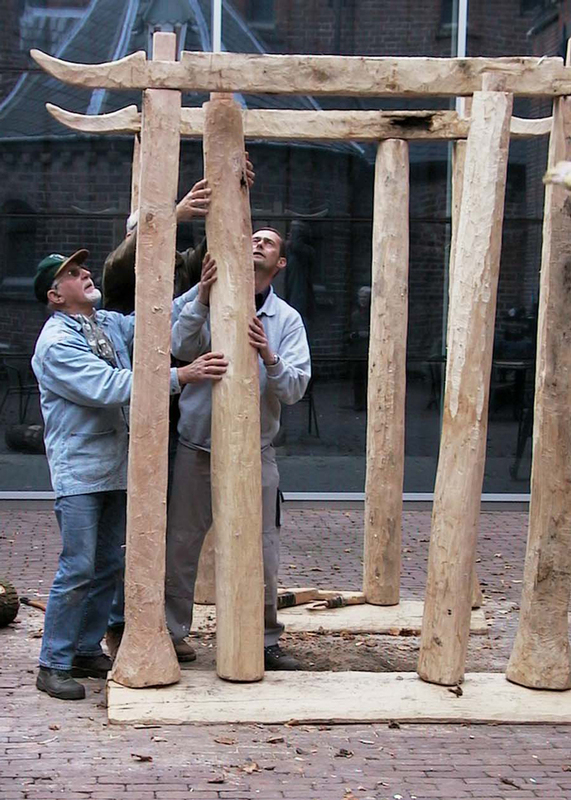 When we had an exhibition on Neanderthals, we had the children build a tent out of wooden poles, mammoth bones (replicas) and reindeer skins. There were special demonstrations of flint knapping and the building of bread ovens from clay. The museum is currently closed because of the new construction of the museum expansion. 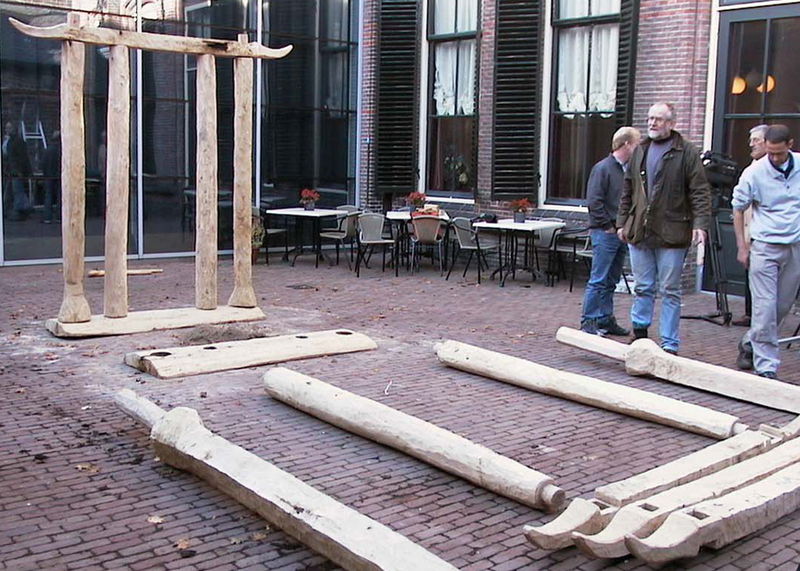 The museum has an important archaeological collection, with objects like the tree trunk canoe of Pesse, the temple of Barger-Oosterveld and several bog bodies. It is not always clear what function the object found once had or how they were made. A way to find possible answers is to use experimental archaeology. The function of the tree trunk canoe of Pesse, for example, has come under debate. It has been suggested by some that it may have been a feed trough instead of a canoe. 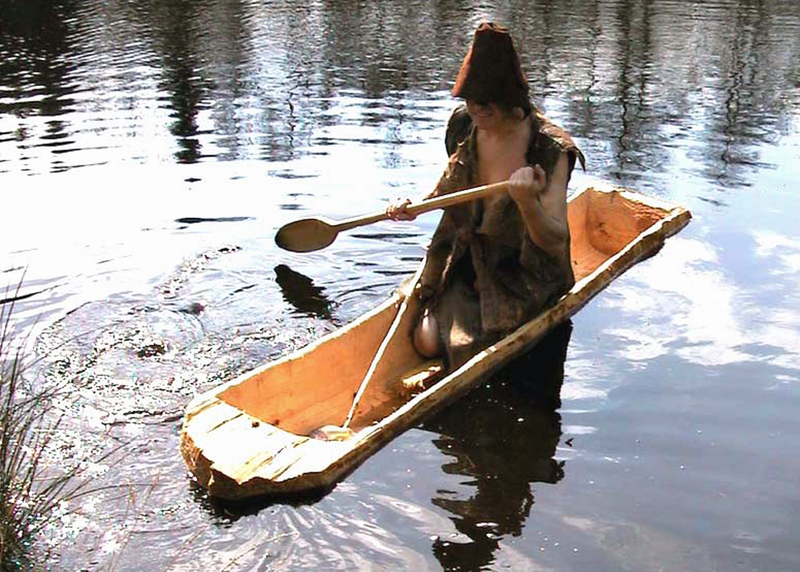 Since the canoe has been dated to be about 10,000 years old, from a period before people became farmers, it is very unlikely that it is a trough. However, how can this hypothesis be tested? The museum decided to make a replica of the canoe using only tools that would have been available 10,000 years ago. This way we got a much better idea of how the canoe was made and how much time it took. Once it was finished we launched the canoe, and it worked beautifully. We now have evidence that it could have been used as a canoe, but that a person larger than 1.8 m and heavier than 80 kg would have had a hard time keeping the canoe stable. Fortunately, most people 10,000 years ago were not this tall or heavy. 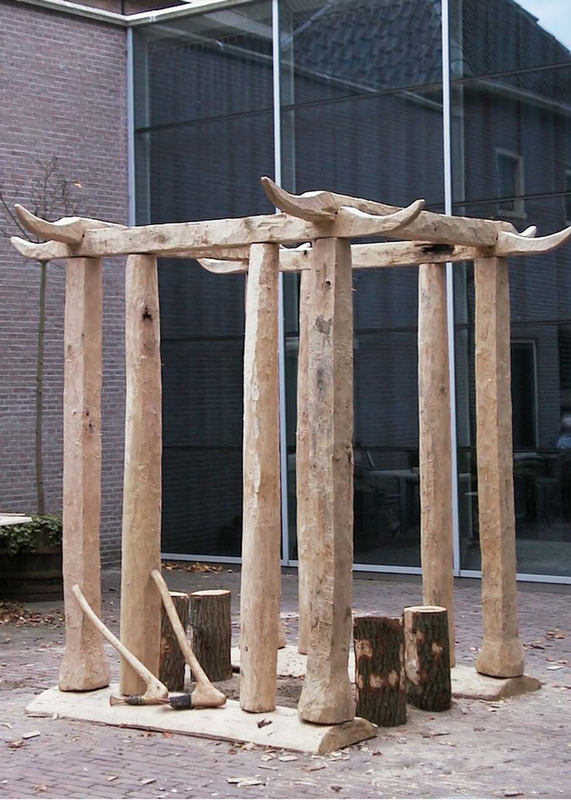 The Bronze Age temple of Barger-Oosterveld (about 1475 BC), which was found at the end of a bog bridge, has also been reconstructed using the tools that the builders of the original temple may have used. The temple was destroyed at some point and was incomplete when found. Because we rebuilt it, we now know that its size was 2 x 2 m and consisted of eight oak poles that rested on wooden boards. Of course, there often are several solutions to a problem. For example, there are two different reconstructions of a Stone Age stone-drill based on experiments that show that both were possible. The museum re-opened its doors in November 2011 after a period of building our new exhibition hall. We are still working hard to realise the new children’s museum to replace the old discovery room with a new theme: Energy. The completely new archaeology exhibition includes the results of different experiments. There will also be an educational room at the art department and the archaeology department. Different activities from the field of experimental archaeology will be used, especially in this last room. We will continue to let children experience for themselves, to discover answers for themselves and we also hope that we can continue to have experiments in the future to find possible answers to questions that have not been answered yet. Fig 3. A temple in parts. Fig 4. Putting a temple together. Fig 5. A temple with axes.